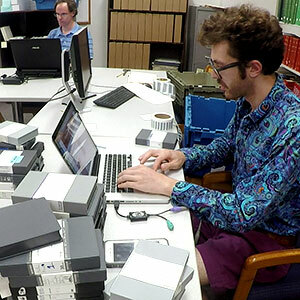 Before MDPI can digitally reformat audiovisual media objects, we need to prep them. We identify what's important. Not every piece of media will be digitized. We conducted a census of time-based media to help us prioritize. We also carry out additional Best Copy Selection for film if we hold pre-production elements and/or multiple copies of projection prints. This ensures the most complete copy in the best condition is preserved. We organize our holdings by format and by technical characteristics. To maximize efficiency, we group together items that share similar technical characteristics or problems. For example, we separate full-track mono open reel audio tapes from stereo open reel audio tapes because they need to be reformatted using different setups. We make sure we can track each object. With so many objects being digitized at once, it's important to know where each one is in the process. We assign each object a barcode and ensure it has a record in our Physical Object Database, which tracks where it came from and where it's going. We send them for digitization. Once we determine what can be formatted efficiently together, we pack those objects in groups that should feed the reformatting queue for two weeks and send them to our MDPI digitization facility in the Innovation Center.